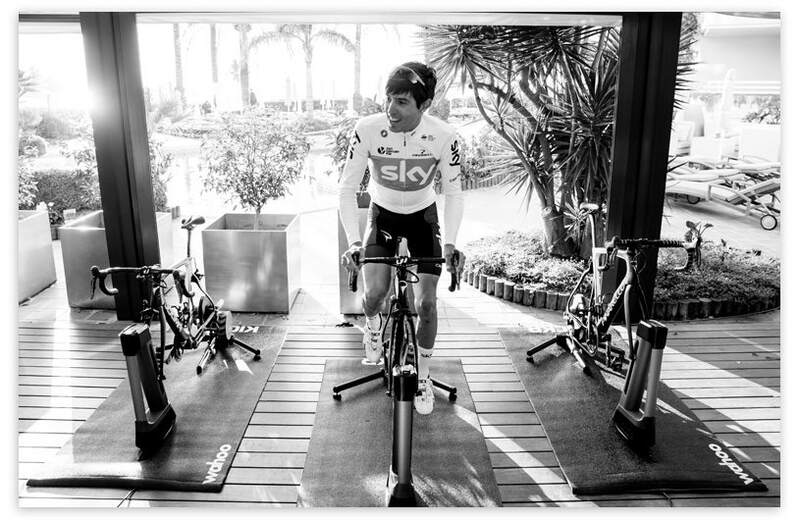 your trainer's resistance combines with assents and descents for a truly immersive indoor training experience! 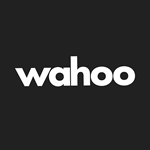 The Wahoo Fitness app is a running, cycling, and workout app that leverages your smartphone to deliver data-driven power that fuels your training and fitness goals. 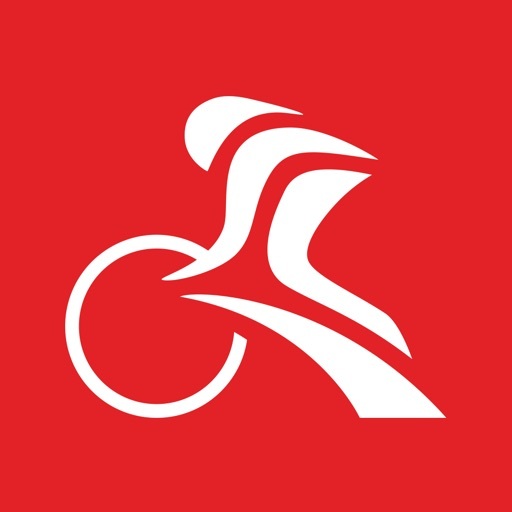 Get the app now to register your KICKR CLIMB and get cranking. *Please check your specific KICKR '17 serial number as outlined in the Identify KICKR by Serial Number section beneath the image. KICKR trainers with serial numbers that do not meet these requirements are not climb compatible. Always observe these precautions when riding the KICKR CLIMB to avoid serious bodily injury or equipment damage. Consult your physician before beginning or modifying any exercise program. Ensure bicycle is properly secured before every ride. 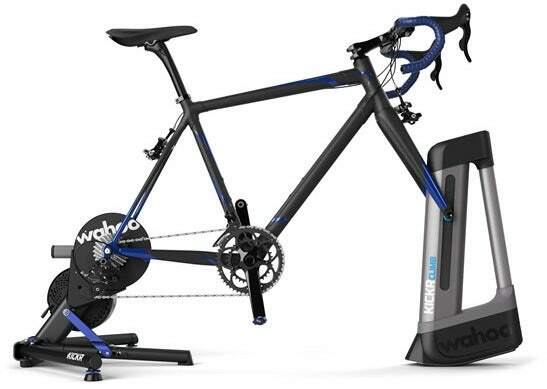 Only use KICKR CLIMB with approved Wahoo Fitness smart trainers. Remember to check all bicycle components after removing the KICKR CLIMB to ensure safety before riding elsewhere. Do not exceed 250lbs weight limit. Excessive weight on the KICKR CLIMB may cause failures and/or permanent damage. Only use the power adapter provided with the KICKR CLIMB. Keep power adapter away from heated surfaces. Never place the power cord under carpeting or in confined spaces which can accumulate heat. Do not place objects or furniture on the power cord as these can pinch or damage it. 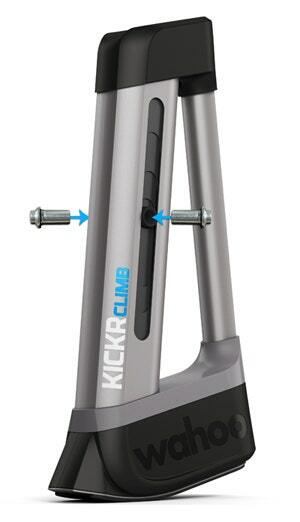 Use KICKR CLIMB only on a stable, level surface. Use caution standing while riding. Do not dismount with components in motion. Wear appropriate clothing and shoes while using KICKR CLIMB. Avoid any clothing which may get caught in moving parts. Do not put hands, body parts, or other objects near moving parts. Keep children and pets away from KICKR CLIMB while in use. Take caution when handling the KICKR CLIMB after workouts as it may become hot with extended periods of use. Only use this exercise product as intended and described in this guide. Do not modify the product in any way. Riders are responsible for reading instructions completely before riding. Wahoo Fitness is not responsible for any damages from improper installation or misuse. Download the Full KICKR CLIMB Quick Start Guide as a PDF for instructions in English and other languages. The KICKR CLIMB ships with four adapters designed to fit both quick release and thru axle forks. Check your bike's manufacturing specifications to select the right adapter for your bike before proceeding. Additionally, be sure to set up your KICKR CLIMB and trainer on a clean, non-slippery, and fully level surface to prevent injury or equipment damage. Insert the correct adapters for your bicycle into the axle holes in the CLIMB, as shown below. Install your bicycle on an approved trainer following the trainer's provided instructions. 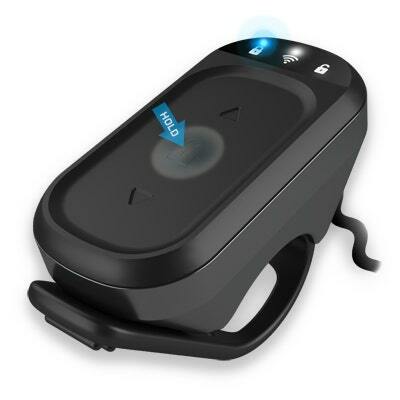 Only use an approved trainer as specified in the SMART TRAINER COMPATIBILITY section above to avoid damage or injury. Remove your bicycle’s front wheel and center the KICKR CLIMB just in front of the fork. Use the quick release skewer (1) included with the CLIMB. Insert the quick release skewer (1) into the KICKR CLIMB. Lower your fork (2) to fully seat the fork’s dropouts on the skewer. Ensure the fork is level and the dropouts are lowered completely onto the skewer to prevent injury or damage. Tighten the quick release acorn nut and clamp the lever closed, securing your bicycle. The nut should be tight enough to leave an impression on your hand when clamped. 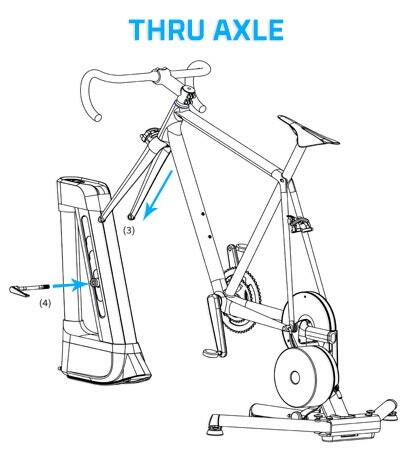 Use the thru axle (4) included with your bicycle. Lower your front fork (3) to align the dropouts with the holes in the center of the thru axle adapters. Finish mounting your bicycle by inserting the thru axle (4) through the fork and the CLIMB's adapters, tightening securely. 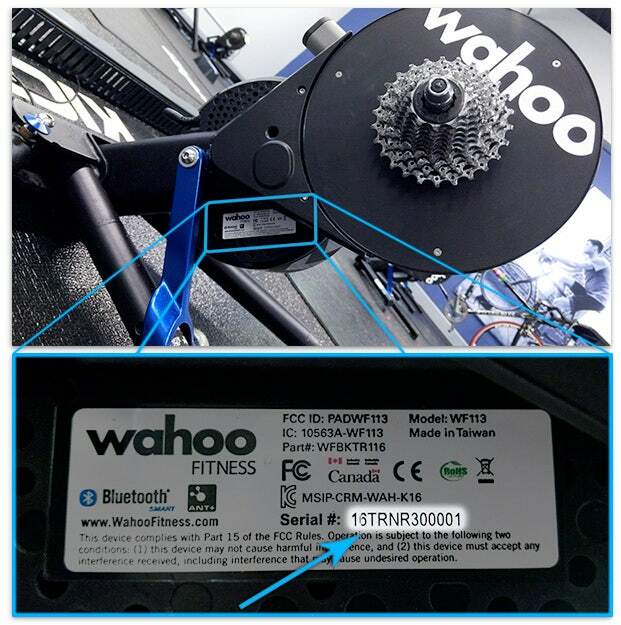 Once paired, be sure to update your KICKR CLIMB firmware and input your bike's settings into the Wahoo Fitness App before riding. After updating and inputting your bike's settings, you're ready to go! Use your KICKR CLIMB with any compatible app in unlocked mode. NOTE: The KICKR CLIMB always starts and wakes in locked (AKA manual control) mode to prevent it from moving unexpectedly. 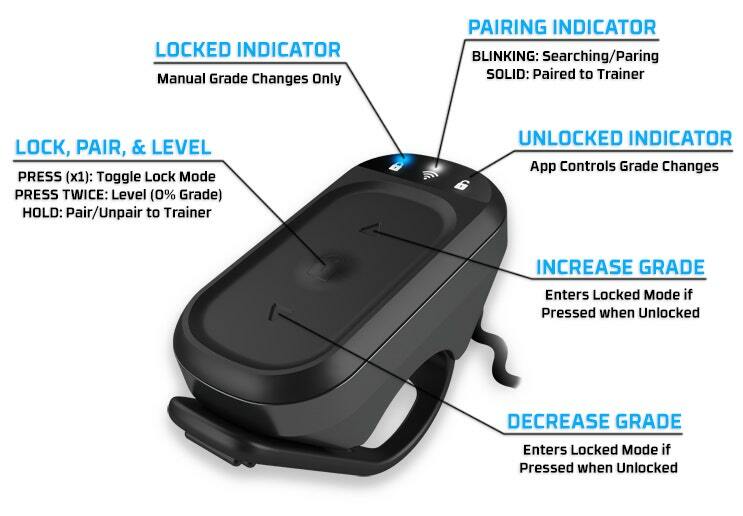 Tap the center lock button on the KICKR CLIMB to enable unlocked mode (indicated by the remote's blue LED moving to the unlocked side) for control through any app that sends grade data to your smart trainer. Always reset the CLIMB to level before riding by double tapping the center lock mode button, then counterbalance the CLIMB (like a pendulum) by raising the handlebars until the unit is off the ground, allowing it to swing freely and come to a complete stop before setting it down. This ensures the CLIMB is accurately positioned directly below the fork to counter any slip from previous rides. Only counterbalance after leveling the CLIMB by double tapping the center lock mode button. 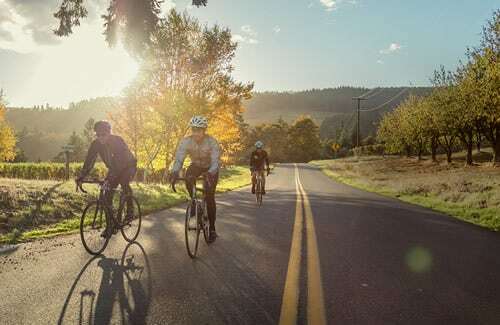 Ensure your Wheel Circumference, Bike Type, and Wheelbase are properly configured for your bike from the KICKR or SNAP page in the Sensors section of the Wahoo Fitness App. See full instructions here. Keep handlebars straight while riding. Always keep the CLIMB properly centered with your bike and on a level surface. Do not use the CLIMB on unstable surfaces or "rocker plates." Misuse voids the warranty and may cause serious injury or damage. Keep your riding area clear of obstacles. Ensure no part of your bike impacts other surfaces (like the Wahoo Desk) while riding. Only ride on clean, non-slick surfaces. For best results, use a designated trainer mat like the Wahoo KICKR Trainer Floormat. Always check bike components (especially the brakes) before riding outdoors. Use the CLIMB in the Wahoo Fitness App (instructions here) for grade control through your phone from the KICKR Control Page. Pair your smart trainer with a supported third party app like those found in our recommendations below. Note: Since grade changes depend on route information, ride experience may vary with route. After pairing your KICKR CLIMB with a KICKR or KICKR SNAP, any third party app that supports sending grade data to your trainer will automatically control the CLIMB. Since the CLIMB pairs with your KICKR (and not the app), you just need to ensure your CLIMB is in unlocked mode and pair your smart trainer to a third party app for the CLIMB to elevate your ride!